Ferries	from North Kingstown RI, Woods Hole, Falmouth, Hyannis, New Bedford and Nantucket. Planes	from Boston, Hyannis, Nantucket, New Bedford and Providence. Lots of ways to go to Martha's Vineyard island by car, train, bus, ferryboat and airplane. If you need to park your car while visiting Martha's Vineyard, be sure to calculate the cost of parking for the time you will be away from the mainland. This cost may be $15 to $20or more per calendar day. From Memorial Day weekend through Labor Day weekend, SeaStreak operates one daily fast catamaran passenger ferry from Highlands NJ and East 35th Street, New York City, to Oak Bluffs on Martha's Vineyard. The voyage takes nearly 7 hours from Highlands, nearly 5 hours from New York City and costs $165 to $200 per adult, one-way, with discounts for round-trip travel. The Dattco bus company has teamed with SeaStreak to connect Boston's South Station Bus Terminal with the New Bedford MA State Pier for the SeaStreak ferries to Oak Bluffs on Martha's Vineyard. An advantage: buses going to New Bedford do not suffer from the weekend bridge-traffic delays of buses crossing the Cape Cod Canal to Falmouth, Woods Hole and Hyannis. 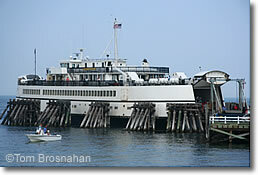 For information on the SeaStreak ferries from New Bedford to Oak Bluffs, see New Bedford Passenger Ferry, below. Peter Pan Bus Lines runs buses from Boston's South Station Bus Terminal to Woods Hole for the Steamship Authority ferryVineyard Haven and Oak Bluffs (map). The m/v Island Queen passenger ferry sails from Falmouth Harbor on Cape Cod to Oak Bluffs on Martha's Vineyard seven times daily in summer. 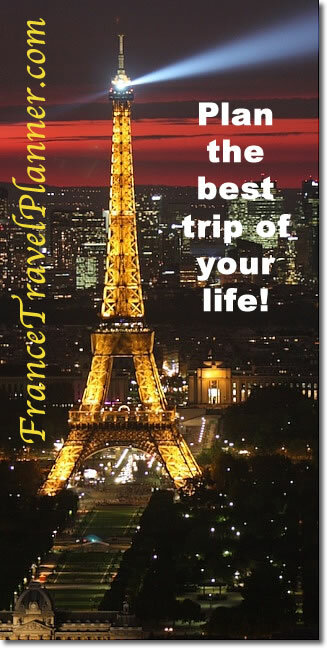 It's a comfortable, fun and inexpensive way to go. Hy-Line Cruises operates six fast, comfortable catamaran passenger ferry trips daily in high summer between Hyannis on Cape Cod and Oak Bluffs on Martha's Vineyard. The voyage takes one hour and costs $59 per adult, round-trip. From Memorial Day weekend (late-May) through Columbus Day weekend (mid-October), fast catamaran ferries operated by Vineyard Fast Ferry run from Quonset Point, Wickford (North Kingstown) RI south of Providence to Oak Bluffs on Martha's Vineyard. The 90-minute voyage costs $89 to $99 per adult, round-trip. Quonset Point is just off I-95 about 15 minutes' drive south of Providence's T F Green State Airport (map). —All parking is right at the dock and costs only $10 per day. —There is shuttle service (tel 401-737-2868 ext. 2) from Amtrak's Kingston RI train station and from Providence's T F Green Airport to the Quonset Point fast ferry dock ($22 per person). From late-June to mid-September, Hy-Line Cruises, Ocean Street Dock, Hyannis MA (tel 508-778-2600) operates at least one and as many as three daily Inter-Island passenger boats (morning, noontime and afternoon) in each direction on the 2-1/4-hour voyage between Oak Bluffs on Martha's Vineyard and Nantucket island. Cape Air (tel 800-227-3247 or 508-771-6944) flies frequently in summer to Martha's Vineyard Airport (MVY) from Boston's Logan International Airport (BOS); Hyannis MA (HYA); New Bedford-Fall River MA (EWB); Nantucket MA (ACK) and Providence RI (PVD). A Steamship Authority car ferry waiting in Oak Bluffs, Martha's Vineyard, to load cars and walk-aboard passengers going to Woods Hole MA on Cape Cod.